Dallas does everything big — including commutes. According to a new Apartment List study, examining commuter data from 2005 and 2016, one in 45 commuters in the Dallas metro are “super commuters,” traveling 90 or more minutes to work each day, and the prevalence of super commuting is on the rise. The share of Dallas commuters who are making super commutes increased from 1.8 percent in 2005 to 2.2 percent in 2016, a 22.3 percent increase. The increase in super commutes from 2005 to 2016 was seen throughout the country. About three-quarters of the 100 largest U.S. metros and 39 states experienced an increase in the share of super commutes over this same period. Nationwide, the share of super commuters increased 15.9 percent from 2.4 percent in 2005 to 2.8 percent in 2016. By 2016, nearly 4 million workers, or one in 36 commuters, were traveling 90 or more minutes to work each day. Many experts attribute the rise in long commutes to “skyrocketing housing costs and a reluctance to move, born out of memories of the 2008 financial crisis.” Additionally, much of the new housing stock, including in Dallas, has been built on the periphery of metropolitan areas. Commuting from these areas to downtown job centers, particularly during rush hour traffic, can be particularly burdensome. Dallas ranks 39th in the list of the country’s 100 largest metros for the share of super commuters, with a smaller share of super commuters than Houston (2.6 percent), and a similar share of super commuters as San Antonio (2.2 percent) and Austin (2.1 percent). The cities with the largest share of super commuters are large metros with strong economies and congested traffic, also seen in their surrounding areas. 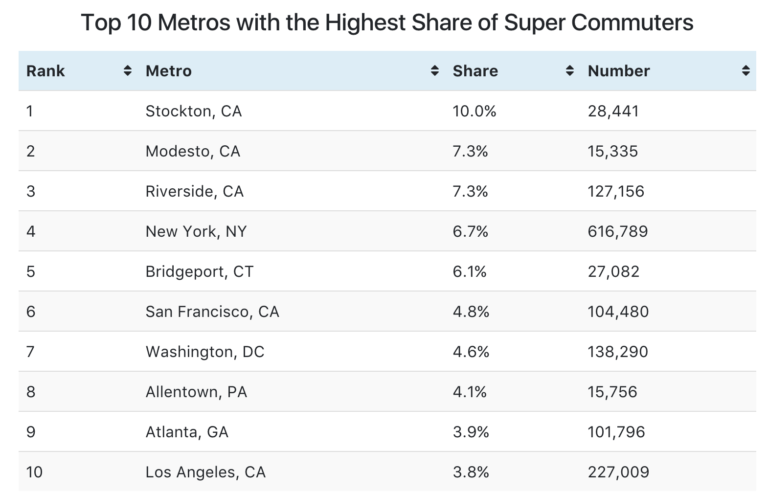 Eight of the 10 metros with the largest share of super commuters are in regions surrounding three notoriously expensive cities: San Francisco, Los Angeles, and New York. Super commuters disproportionately rely on public transportation. An estimated 91.4 percent of commuters who travel under 90 minutes to work commute via private vehicle, compared to 69.7 percent of super commuters. In the Dallas metro, 97.3 percent of non-super commuters travel to work via private vehicle, compared to 86.8 percent of super commuters. In Dallas, lower-income super commuters disproportionately rely on public transportation. An estimated 16.3 percent of super commuters earning below the median income commute via public transportation, compared to 7.9 percent of those above the median income. When transit usage falls sharply with income, it suggests that transit is used out of financial necessity rather than as a lifestyle choice. While super commuting is still the exception rather than the norm, the growth in super commuters in cities around the country is quite alarming. Reversing the growth in super commuters, and long commutes more generally, requires investment in both increasing housing supply and improving public transportation.